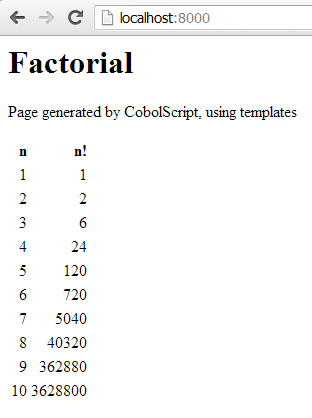 perform show-factorial using n varying n from 1 to 10. Next post: a dynamic web site accessing MySQL database, using CobolScript. SimplePipes: A way to define message-passing using ‘pipes’ to connect different defined nodes/functions. I want to extend it to have distributed process. SimpleBoggle: Boggle solver, it is better than me! See console sample. SimpleChess: Work in progress, define a board using SimpleBoard, and make moves. I’m working on SimpleGo, too, to have a board, game, and evaluators. SimpleWeb: web middleware, a la Connect, with web sample. SimplePermissions: Today code kata. It implements subjects, roles, and permissions, granted by context. SimpleMapReduce: Exploring the implementation of a Map-Reduce algorithm. Cellular: Cellular automata implementation, including a Game of Life console sample. NodeDelicious: To retrieve my links from my Delicious account, now the site was revamped and no more pagination. SimpleDatabase: In-memory database, maybe I will add file persistence. SimpleSudoku: Rewrite of my AjSudoku solver, from scratch. I could use the template support to generate text files, that is, to implement code generation in CobolScript, as I did in AjGenesis (classic, Ruby, Node.js). I already have a dynamic web page implementation based on this template engine (yes, dynamic web pages in CobolScript ;-). But that is a topic for another post. display n "! = " result. factorial using n local m.
– perform … using … You can call a local procedure passing arguments. – <proc> using … The procedure declares its arguments. – <proc> local(s) … The procedure declares its local variables. – perform … giving <var>… You can specify that a perform has a return value, to be saved in one or more variables. – return (expr) The procedure can return at any point. A return value could be specified.